Therefore walking at guess she found the hill, which was indeed close at hand, by the rising of the ground before her feet; and slowly she climbed the path that led up from the east. And as she climbed so the fog grew thinner, until she came at last out into the sunlight on the bare summit. Then she stepped forward and looked westward. And there right before her was the great head of Glaurung, who had even then crept up from the other side; and before she was aware her eyes looked into his eyes, and they were terrible, being filled with the fell spirit of Morgoth, his master." I remember many years ago finding myself staring at a poster map of Beleriand in The Little Bookroom in Melbourne. For a kid who had grown up fixated on Tolkien, even to the point of bothering Rayner Unwin with a package of Lord of the Rings drawings in about 1977 (when we were making a comic of The Hobbit for the school magazine), the discovery that there was going to be more from Tolkien - let alone a whole new world - was a revelation! As great as The Silmarillion turned out to be, somehow its abundance of ideas and imagination wasn't fully realised in terms of consistent narrative depth. Christopher Tolkien did a stellar job of cobbling together his father's work into a cohesive whole, but often the text lacked the glorious prose and evocative mastery that came from J.R.R. 's writing and rewritings. Christopher had been often obliged to choose between different versions in order to put together the narrative, though less so with The Silmarillion than many of the later collections. Apparently, Guy Gavriel Kay suggested early on that some of these tales could be completed as books in their own right, but CT chose to keep the works pure and release them largely as a series of incomplete tales. Coming up on 17th April is the release of an all-new Tolkien book, The Children of Húrin. This would may surprise some, but one of my favourite Tolkien books is the excellent Unfinished Tales, which contains a collection of Tolkien's most finished tales outside of his famous work, and includes a substantial and enjoyable version of this story. Probably, my favourite part of Unfinished Tales is Of Tuor and his Coming to Gondolin, a sublime piece of writing that just cuts off at the end. 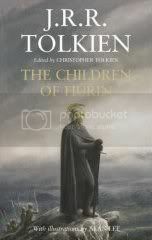 While this is related to, but not included in, The Children of Húrin (Tuor is Túrin's cousin) it certainly has the potential to be a fantastic tale in its own right. 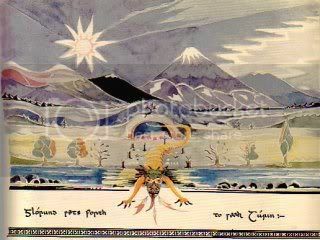 At left is a very old ink and watercolour picture by Tolkien himself, showing a much earlier incarnation of "Glorund" setting forth to seek Túrin. 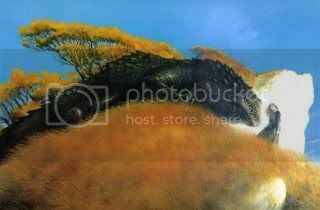 However, Glaurung isn't a likeable dragon like Smaug or Chrysophylax - he's something else altogether. In reading Unfinished Tales it is often necessary to step backward and forward to The Silmarillion in order to bridge the pieces. A complete book of the The Children of Húrin will be very welcome, but don't expect an uplifting saga in the vein of The Lord of the Rings. With all the grace of classic tragedy this is a dark journey with a sting in its tail, from a true master writer. For more information see Children of Húrin FAQ. I reread The Silmarillion a few years ago (when I was laid up with a wrecked knee) - it flowed better than what I remembered, though there are a couple of major threads that stand out. I could imagine Peter Jackson doing a good job of filming Beren & Luthien (something I'd like to have a crack at adapting in comics form, but that ain't likely to happen :)). I remember reading Farmer Giles of Ham many years ago. I also remember Tolkien's artwork gracing an early edition of LOTR. KHand, Pauline Baine's illustrations for Farmer Giles of Ham, Smith of Wooton Major and The Adventures of Tom Bombadil add to the charm of those stories - I love how she draws Chrysophylax. Baines' drawing for Tree and Leaf sticks in the mind as well (that one's an interesting tale about mortality, when it turns out Tolkien had many, many more decades ahead of him) :).